Although the principle of diversification is a key investment management strategy, when it comes to gender diversity, the investment industry is still largely dominated by men. CFA Institute recognizes this and is currently pushing to close the gender gap in the investment profession. Some countries, like Vietnam (43 percent) and Romania (39 percent), have a better men-to-women ratio than others, such as Saudi Arabia (3 percent) and Qatar (6 percent); however, according to a 2016 CFA Institute study, Gender Diversity in Investment Management, women represent less than one in five CFA charterholders globally. In Russia, the number of female CFA charterholders has increased by 2 percent over the past year. The 2016 report revealed that 15.5 percent of CFA charterholders in Russia were women. In 2017, that number has risen to 17.5 percent. 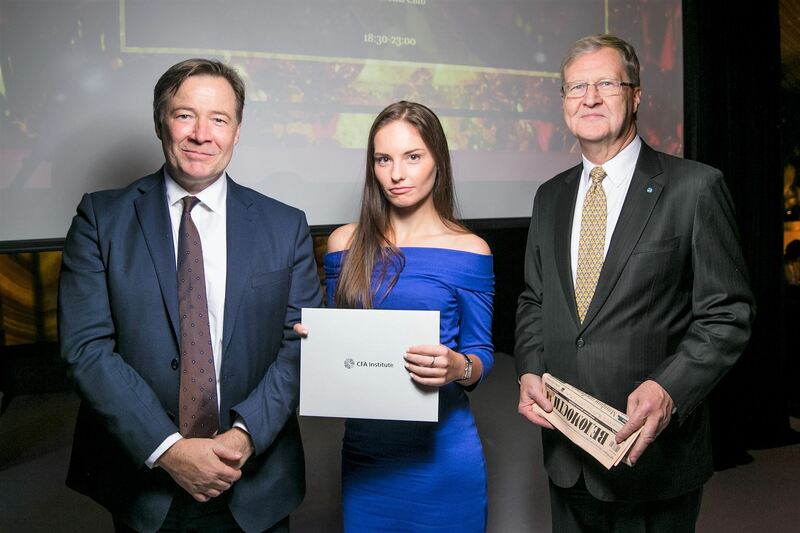 Gary Baker, Managing Director of CFA Institute EMEA (on the left) and Neil Withers, President of CFA Association Russia (on the right) with a new charterholder during CFA Russia's Annual Charter Awards Ceremony in December of 2016. Compared to other countries in Eastern Europe, Russia scored below Romania and Bulgaria (27.6 percent), but above Hungary (13.5 percent), Ukraine (13.1 percent), Poland (12.2 percent), and the Czech Republic (11.1 percent). The two percent hike also brought Russia closer to the United Kingdom (20 percent) and put it above the United States (16.4 percent). On a more long-term basis, CFA Russia has shown an increasing trend in the number of female charterholders. There has been a steady rise from 14.8 percent in 2013 to 17.5 percent in 2017. During his visit in Moscow, Paul Smith, CEO of CFA Institute, emphasized the importance of bringing in more women into the investment profession and making it more diverse. Some of the strategies of attracting and retaining women professionals include university outreach programs and educating companies on the effectiveness of a mixed-gender workforce.